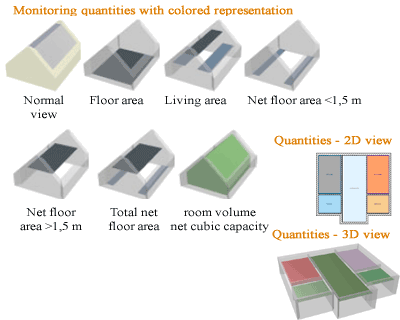 This additional module provides an analysis and a colored representation of masses and areas in 2D and 3D views according to the living space ordinance and standard DIN 277. Furthermore, the calculated areas can be exported into a list form as PDF, EXCEL, RTF, and HTML format. The user interface consists of two tree views - scope and selection. The required scope, construction elements and masses are activated and deactivated using check boxes. Visualizations can be produced for buildings, floors or individual apartments. The visibility of deactivated objects remains unchanged. A particular level can of course be activated or deactivated in a view using the settings for visible layers, e.g. ground floor, upper floor, top floor. If the option for ‘Automatically adjust display of element“ is activated, then masses and construction elements that have not been selected are transparent or invisible, otherwise they will be displayed normally. 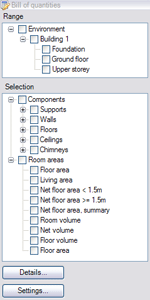 In the section for area segmentation you can specify whether areas should be divided into sub-areas. If so, areas are divided according to the formula for segmentation, and are displayed in different colors. 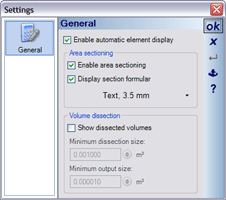 The formulas used for segmentation can also be displayed, and their text properties can be modified, if necessary.